What is Charity by Design? Alex and Ani bracelets celebrate the individual. Yet the spirit of the brand is about helping each other. In 2011, the company started the Charity by Design program as a way to give back. Through this program, Alex and Ani partners with charities to design a beautiful bracelet specifically for that group. When you purchase a bracelet from the Alex and Ani Charity by Design collection, 20% of the proceeds go to the designated charity. To date, Alex and Ani has been able to donate over $20 million to various charities through the Charity by Design program. When Alex and Ani partners with a charity, they work with the organization to design a meaningful charm. The designs are so much more than logos. For example, the optimistic, compassionate, and resilient sunflower was chosen for the Alzheimers Association bracelets. A captain's wheel points the way to a bright future in bracelets benefiting The Herren Project, which provides support to live a life of sobriety. Come into The Little Traveler's bead room to learn more about the meaning behind the creative designs. See which ones speak to you most. The spirit of giving extends beyond donations made through sales of bracelets. Alex and Ani employees volunteer time to help many of the charities personally. In addition to vacation and sick days, Alex and Ani employees are allotted time off of up to 8 hours per quarter to volunteer. They give that time to the charities dearest to their hearts. 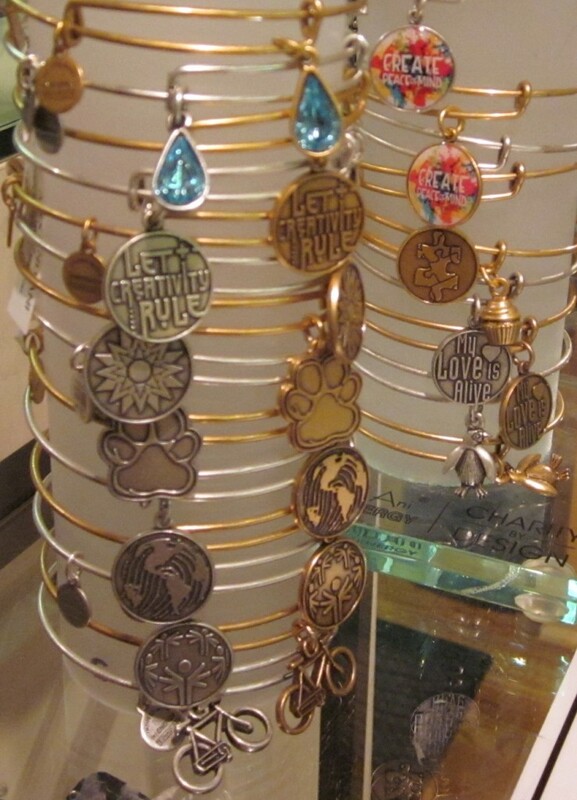 Alex and Ani flagship stores often host events to help causes beyond those aided by Charity by Design bracelets. Soon, the company plans to introduce charitable parties at partner stores. Be on the lookout for a party at The Little Traveler! The Charity by Design program is growing to include national organizations, like the American Heart Association. This way local agencies near you can benefit. The program has also expanded to give internationally. Alex and Ani recently partnered with Living Water International, a group helping communities around the world acquire desperately needed clean water. Watch the video below to learn more about this exciting partnership.